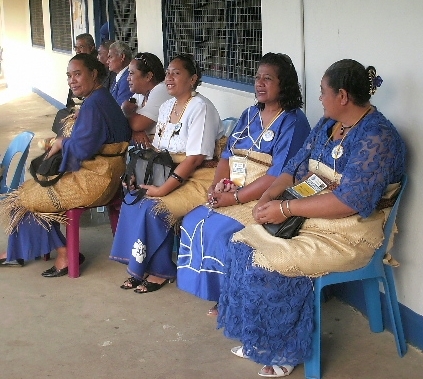 THE GOLDEN ANNIVERSARY OF TUPOU HIGH SCHOOL was held during the second week of June 2013 in Nuku'alofa. 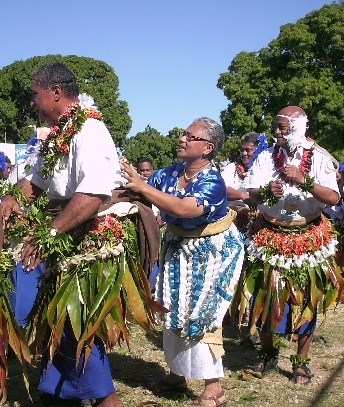 The Tongans love to have this kind of celebration whenever a significant timespan has been achieved by an institution. Since the annual church conference followed right after the Jubilee, and with the feasts happening at the same location they just seemed to blend together (I put the feast photos together). So you can see that this type of celebration seems to be happening just about all the time, but some are bigger than others. This particular one was very big, however. I attended the event along with the principal Tui'Pulotu Finau, who I met way back in 2002 when he visited my church in Hilo, Hawaii. There were parades, singing concerts, dancing, bands playing, church services, many honorees and of course many feasts. 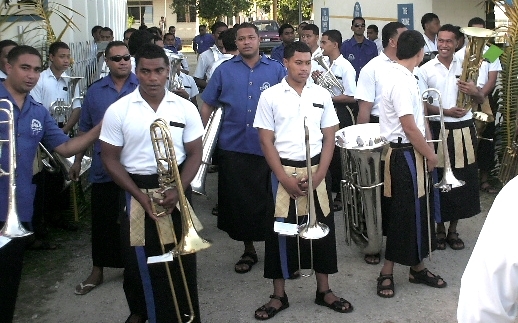 The musician at the left is Hopoi Vou, one of the finest Tongan musicians. You should hear his performance of Sisu E - a magnificent work of great beauty. I have enjoyed his music greatly when I catch him performing or when his many recordings are on the local radio broadcast. He has programmed many church music songs on his Yamaha PSR keyboard, which are used by many of the Tongan churches. I know it is possible to program and record vocal tracks with harmony supplied by the IVL software found in the PSR keyboards, but I believe that Ho'opoi lays down the vocal harmonies in recorded tracks within the PSR instead of using the harmonizing feature. I have also heard the harmonizer used very effectively. Here he was performing at the old Tupou High School location in downtown Nuku'alofa where all the alumni were coming for registration. This campus is now Tupou Tertiary Institute, offering only post-secondary degree programs. Tupou High School is now just the Vaololoa location in Fanga, just south of downtown. Here is a group of several of my colleagues at the registration the first morning at TTI. Everyone is dressed in the Wesleyan dark blue school colors and has their identification proudly displayed. The band is dressed in their blue and black marching uniforms and getting ready for the parade. We are listening to Ho'opoi and the Tongan Broadcasting Services is making a live radio broadcast of the opening ceremony. Soon after this we began a huge procession from TTI down Wellington street to the Centennial Church, with all the alumni present marching in groups by the year of their attendance. I marched along with the 2005 group since I was a teacher at TTI during that year and knew many of the others both students and teachers who were along for the march. Here on the left is my friend Tevita Fauonuku at the Ma'amaloa Grounds adjacent to the big central Free Wesleyan church, called Sione or Centennial. Tevita is a very talented Tongan musician and dancer, who choreographed a major dance that will be performed by the entire Tupou High School for the Princess. There is going to be some big feasting going on, with the usual organized dancing, the typical unorganized dancing, the presentation of gifts to Princess Pilolevu and other royalty, many speeches, and eating. I managed to snap this great picture of Feleti Atiola participating in a dance by all the administrators of the Free Wesleyan schools, with Unga'tea sneaking up behind him to give a little encouragement. It's not often that I will see my friend Feleti involved in this kind of activity and this is probably what Unga'tea was thinking too. Feleti was the director of education for many years and I was sure the job was going to kill him, but they finally moved him to principal of Tupou College out in the bush. 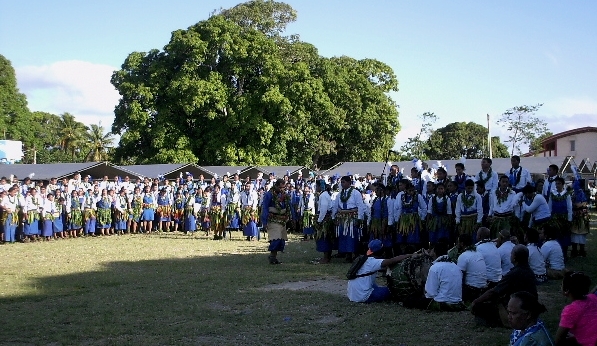 At the left you can see Tevita preparing the entire school body to begin the performance of his 'Heiva'. In the four millenia plus of Tongan arts history, there really was no distinction between music and dance. This is common in many native cultures around the world. The first Europeans who had contact with the Tongans learned that the word 'Heiva' applied to the music that accompanied the dance, as you don't have dance without music. But the truth is that the Tongans mostly did not have music without dance either. Preparing for this performance took many weeks as the song had about 7 or 8 verses. I can remember many times Tevita had been working the students until his voice became quite worn out, but his enthusiasm never diminished one bit. 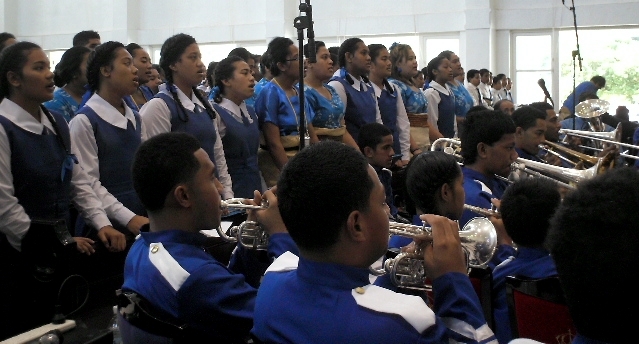 In addition to the performances at the feasting grounds, the band and choir performed several items at the Vaololoa campus assembly hall and at the Centennial church services. It was a very busy time for all of us. I had been earnestly working to finish the new studio at Tupou Music School in time for the blessing and gave myself a major case of 'drywall elbow' that lasted for months thereafter! I was so proud of all the students and the wonderful performances that they had prepared. It was so much work that they even moved into the school classrooms for a few weeks during the preparations. We were very fortunate to have Save Mataele on hand to help us. Save was the choir director a couple of years ago but has moved to New Zealand as he is working to finish his Bachelor's of Music at the New Zealand School of Music. Many of the students who had sung in the choir when Save was at THS had come back to sing for him again and performed at the Jubilee. 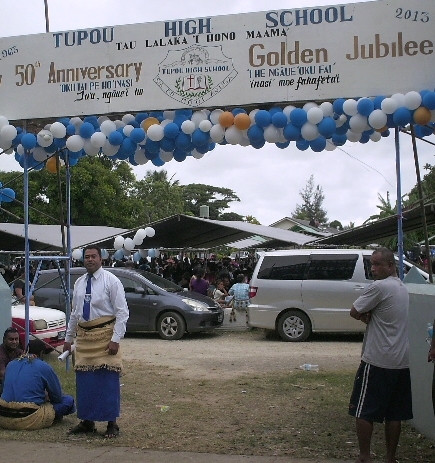 The Golden Jubilee of Tupou High School was a very special event, with a memorial plaque being presented to the school by King Tupou VI. 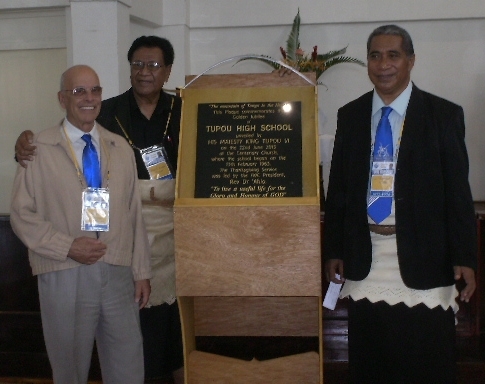 Standing on the left of the plaque is Dr. John Norman, who was the first principal of Tupou High School from 1963 - 1965. I had a chance to have dinner with John, a wonderful gentleman who had some very entertaining stories about all of the Tongan administrators. He said that when he was asked to come to Tonga by the president of the Free Wesleyan church, he had to ask why they would want him to do this, and he was told that there were only two other people in Tonga with a terminal education degree at the time, and one of those was the King. He said that he had not been back to Tonga since that time, and so we were very fortunate to have him present for the Jubilee.